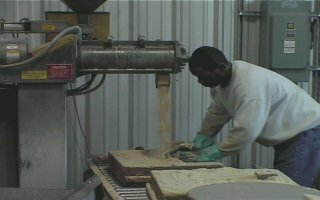 Sand molds are created using a wood, metal or plastic pattern. The pattern can be a dump box, match plate, or a loose piece. Sand is mixed with a urethane binder in a high speed mixer. This sand is deposited into box containing the pattern and all essential gating, risers and chills for pouring. The sand mixture sets up hard in a few minutes and the mold is removed from the pattern. Cores for forming internal passages in the castings are made using the same process. The molds and cores are cleaned and sprayed with a refractory coating. This coating shields the molten metal from direct contact with the sand and seals the sand grain for better surface finish. Cores are carefully placed into the molds. The molds are then closed and are ready for pouring.